Lock in a great price for Roc Lago Rojo Adults Recommended – rated 8 by recent guests! The food was good, well prepared & presented. The room was spacious & the beds comfortable. Very comfortable beds, and excellent location, stunning view from rooftop terrace. We had a lovely relaxing holiday one of many that we have spent in this hotel. We find it so convenient for the bars,beach,shops and lovely walks. Our room was lovely and very clean,bed was extra large and very comfy. Little disappointed with the balcony but we were out most of the time so it didn't spoil our stay. We used the sun terrace quite often which was kept well only fault was the music being played wasn't good at all. Choice of food in the restaurant was excellent the staff there are brilliant. We will be returning in September and looking forward to it already. Good central location, easy access to beach front and restaurants. The location was spot on and the roof terrace was very nice. The food was good and nicely cooked. Location of hotel. It's perfect for beach .shops restaurants and promenade. Great music each night in the lounge . Excellent location. Right in the centre of all the bars and restaurants of the Carihuela district and a few steps from the large promenade that stretches from Torremolinos right to Benalmadena so plenty of traffic free walking. Also close to bus routes to Mijas, Marbella and Malaga. Rooftop sun terraces and pool are a big bonus as the hotel's surrounding grounds are limited and small (ground floor) pool area is mostly in shade. Excellent food . Plenty of choice and good quality. Roc Lago Rojo Adults Recommended This rating is a reflection of how the property compares to the industry standard when it comes to price, facilities and services available. It's based on a self-evaluation by the property. Use this rating to help choose your stay! 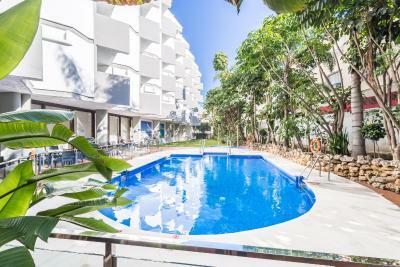 One of our top picks in Torremolinos.Roc Lago Rojo - Adults Recommended (+18) is just 350 feet from the beach in La Carihuela, the old fishing district of Torremolinos. The rooms at Lago Rojo are fully air conditioned and heated. All offer satellite TV and a small, private terrace with a table and 2 chairs. A safe is available for a surcharge. A daily entertainment program is offered. A range of different massages are available in summer. Guests can enjoy international and local dishes at the Roc Lago’s buffet restaurant. 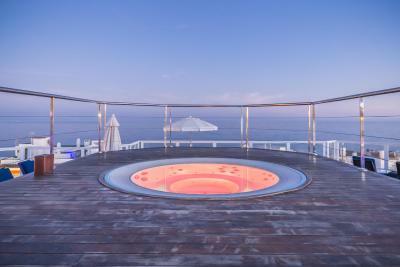 The Roc Lago Rojo - Adults Recommended (+18) has a lobby bar opened onto a terrace by the swimming pool. There is also a TV room. Free WiFi is available in all areas. The property is a-25 minute drive from Málaga center while Malaga Airport is a-18 minutes away. When would you like to stay at Roc Lago Rojo Adults Recommended? This spacious suite has a separate bedroom and living room and a terrace, most with swimming pool views. This elegant room with balcony offers great views of the surroundings. It includes satellite TV, a work desk and a private bathroom with a bathtub and shower. 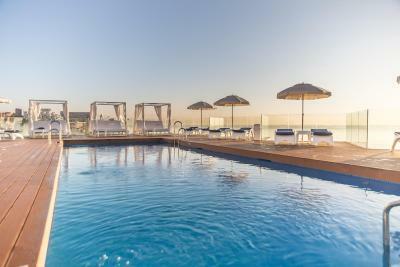 The Hotel Roc Lago Rojo is located In La Carihuela, the very heart of La Costa del Sol, the picturesque old fishing district of Torremolinos. Just 50 metres from the beach, is the ideal place for a truly relaxing holiday. Thanks to the extraordinary climate, the wide range of excellent services and facilities can be enjoyed year-round. Apart from dancing and entertainment in the Bar-Salon and excursions to the fascinating surroundings of Malaga, there is an endless choice of individual leisure activities. All rooms have private bathroom, hairdryer , Sat. TV, telephone, airconditioning (hot/cold), safe box (to rent), mini-bar, and terrace with pool view. 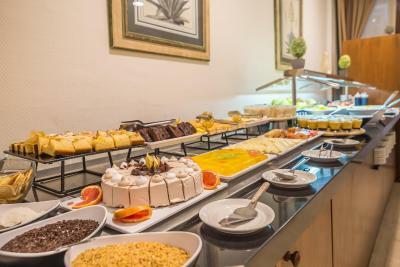 You can have your meals, breakfast and dinner, at the buffet located in the restaurant. On the 6th floor, there is a solarium with deck chairs, jacuzzi and drinks stand. House Rules Roc Lago Rojo Adults Recommended takes special requests – add in the next step! Roc Lago Rojo Adults Recommended accepts these cards and reserves the right to temporarily hold an amount prior to arrival. Please note that gentlemen are kindly requested to wear long trousers at dinner. The pool is very small but there is a great roof garden with sun loungers and bar. Dining room was crowded and sometimes you might have to wait a few minutes to get a table but staff very hard working and helpful. Reception staff were not very friendly. They seemed to be preoccupied with the computers. On arrival it took two to sort out our booking-in. We mentioned I had requested a room with sun in the afternoon if possible but they didn't acknowledge that I had even spoken and when giving us our room keys made no reference to it.- even to say "sorry it wasn't possible "
Restaurant was too small so we had to wait in line for the dinner. Finding a parking place can be tricky. Nice big room with great view from the balcony, receptionist was helpful and printed out our tickets to cablecar, big variety of food (breakfast and dinner). Everything. Was a pity no indoor pool though. Dining room was chaotic..no one in charge staff holding conversations with each other..had to keep asking for things to be replaced many times..never been in such disorganised dining room..and it wasn't busy all the time so no excuse! Breakfast was the best meal..lunch and dinner poor quality..Drinks VERY expensive ..even the water..staff not pleasant ..only one lady at evening (short blonde hair) was nice and polite, others not good when you asked for things. The hot tub on the roof was closed for the low season but don't understand why, as the pool was very cold so would of been nice to use hot tub. Most things, close to beach very clean and excellent food. Staff always happy and willing to help. Restaurant very crowded and busy. Great variety of food but same selection every day. Excellent value for money. Friendly staff. Clean. Good location. Always love this Hotel. Fab location.